According to recent data from the CDC, less than 22 percent of U.S. adults meet the average weekly recommendations for strength training. 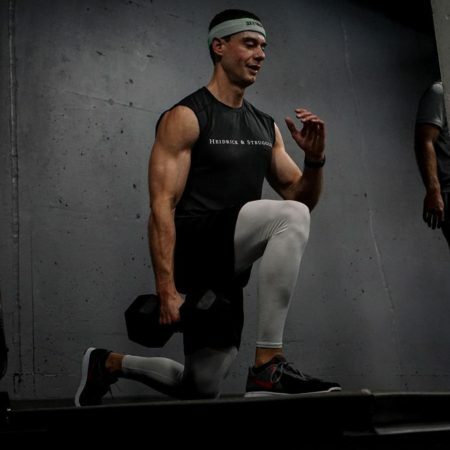 One major cause of this is the myth that strength training will make you “bulky or “too musclebound.” In this article, we’ll overcome that myth. You’ll also learn four reasons why every man and woman (no matter what your goals are) should do some form of strength training each week. Strength training improves your metabolism and body composition. Strength training doesn’t make you “bulky” or “too musclebound.” You get “bulky” from poor nutrition and/or poor sleep. You get “too musclebound” by eating an enormous amount of food, by taking drugs or questionable supplements, or by doing way too much strength training. While strength training can be part of a program designed to get bigger, adding muscle mass takes much more time and effort than many people realize. You won’t turn into Hercules by accident, by eating like a normal human, or by doing a reasonable amount of strength training (i.e. 4-6 sets per body part each week). When combined with proper sleep and the right nutrition program, strength training makes you tighter and leaner, not thicker and bulkier. Strength training turns your body into a more efficient fat-burning machine. It speeds up your metabolism after each workout, possibly for even more than 24 hours after a workout. In addition, your resting metabolic rate (RMR) increases by 30-50 calories per day for each pound of muscle that you build. So, if you were to add 10 pounds of muscle, you would automatically burn at least 300-500 more calories each day. These metabolic benefits came up during many of my interviews for Work Stronger. One excellent example is Rhonda Germany-Ballintyn, a female executive who lost over one hundred pounds (after the age of fifty) by lifting heavy weights. Rhonda told me that she “did not lose one ounce” when her exercise consisted of walking over twenty-five miles a week. 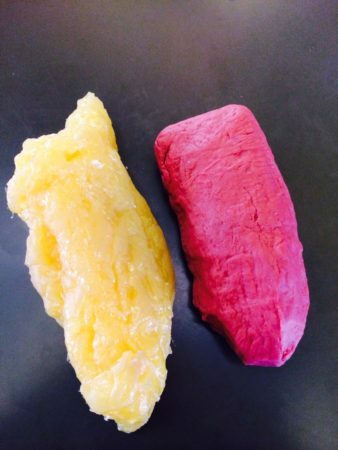 The image on the left is a replica of what 5 pounds of fat looks like. The image on the right is a replica of what 5 pounds of muscle looks like. Which is bigger? Strength training can reduce and prevent injuries and aches. Strength training improves your posture and builds up your bones and joints, too. Many of the physical injuries, aches, and pains that people experience are self-induced by leading a sedentary lifestyle, or by following a lopsided workout program that overemphasizes cardiovascular activity. The latter is common among runners, triathletes, and other endurance athletes, many of whom fear that strength training will make them bigger and negatively impact their race times. Small business owner Kent Wuthrich was one example. When I interviewed Kent for Work Stronger, he told me that he got to the point where he was running forty to fifty miles each week. However, he paid the price for not doing strength training and for being one-dimensional with his workout regimen. Strength training preserves your muscle and delays your aging process. It’s been estimated that we lose 8 percent of our muscle each decade starting at the age of forty, and that we start losing even more later in life. According to Dr. Jeffrey Stout, a professor at the University of Central Florida and a Fellow of the American College of Sports Medicine, the best ways to defend against this are by strength training and eating a protein-filled diet. 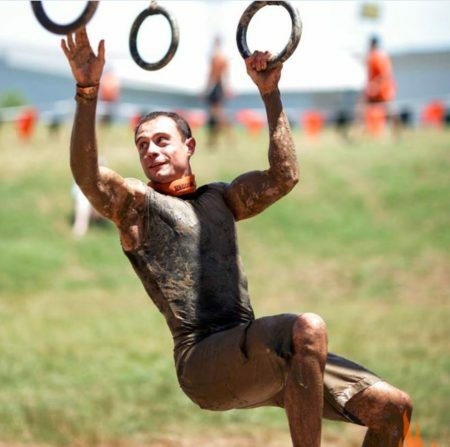 “The more muscle mass you have, the better your life is going to be [as you age],” he says. If you want to age more gracefully and experience less pain and aches later in life, strength training is a must. Strength training changes your identity in a good way. The sole reason that I started strength training in high school was to improve my physical appearance. I was embarrassingly puny as a teen (I was 5’10” and 119 lbs. as a sophomore in high school), had very little confidence, and got tired of being and feeling weak. 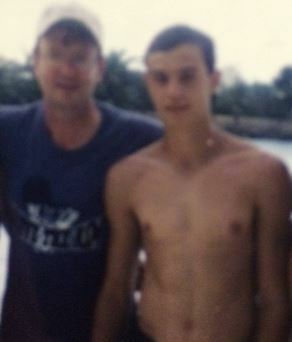 A photo of me in high school (with my father). An interesting thing happened though when I started doing strength training. As my physique improved and I became stronger physically, my overall identity changed. I stopped seeing myself as a “weak person” and started seeing myself as a “strong person.” This new identity carried over into other areas of my life, too. I started standing up for myself more, taking on new and bigger challenges, and stepping out of my comfort zone more often. This led to more confidence, which led to the pursuit of even bigger challenges, and on and on. When you feel strong physically, you can’t help but feel strong in other areas of your life, too. Strength training doesn’t just make you stronger physically. It makes you stronger psychologically. It boosts your confidence, makes you tougher and more resilient, and expands your beliefs for what is possible- all of which make you more likely to succeed with whatever you choose to pursue. Too little strength training makes you injury-prone, weak, and soft. Too much is not good either though. There is a point where more strength training can also make you more injury-prone (i.e. if you train too often or too hard). There can also be a point at which you can become too muscular. What constitutes as “too muscular” is subjective though. 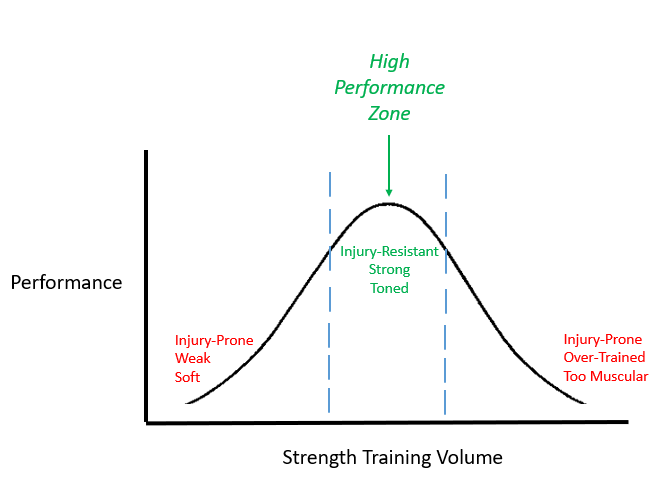 Strength training is another illustration of a framework that I refer to as The Performance Curve, which shows that too little or too much of a positive behavior is not ideal. The goal is to find a sweet spot in the middle- what I refer to as the High Performance Zone. When it comes to strength training, the right volume will make you injury-resistant, strong, and toned. This zone will obviously not be the same for everyone. For example, an NFL linebacker will obviously want to follow a much higher volume than a 75-year-old woman. However, every man and woman should be strength training at least two times each week and hitting all major muscle groups (legs, back, chest, shoulders, arms, and core). Not doing so is a big mistake that will catch up with you at some point. Do you have to lift weights? What about using machines or doing body weight exercises? Free weights (barbells, weight plates, dumbbells, kettlebells, and so on) activate more muscle, develop greater core stability, and require greater coordination than strength training machines. If you prefer not to use free weights or don’t have access to them, you could use resistance bands, or you could do body weight training (i.e. push-ups, air squats, and so on). Resistance bands and body weight training are generally a good place to start your first couple of weeks if you are brand new to strength training. As you get stronger and more comfortable, you can challenge yourself by incorporating free weights and more resistance into your regimen. Getting help from a knowledgeable friend or a competent coach is also a wise idea. Ultimately, a well-rounded strength training program includes a combination of free weights, resistance bands, and body weight training. Each will challenge you in different ways and help keep your workout program fresh. Every man and woman should be doing strength training at least twice a week and for each major muscle group. If you are a beginner, start light and simple. Then, add more resistance and incorporate free weights when you feel ready. Strength training provides many powerful benefits beyond being able to lift more weight. When combined with proper sleep and the right nutrition program, strength training makes you tighter and leaner, not thicker and bulkier. Strength training also improves your posture, reduces and prevents injuries and aches, builds up your bones and joints, preserves your muscle, delays your aging process, and helps you forge a stronger identity. Strength training has definitely changed my life for the better, and it can change your life for the better, too. “National Center for Health Statistics,” Centers for Disease Control and Prevention, accessed on August 6, 2017, https://www.cdc.gov/nchs/fastats/exercise.htm. Tae Nyun Kim et al., “Sarcopenia: Definition, Epidemiology, and Pathophysiology,” Journal of Bone Metabolism, (May 2013): 1-10, https://doi.org/10.11005/jbm.2013.20.1.1.